Clara Theis. Courtesy of Raupp Memorial Museum, Buffalo Grove, Illinois. [S7] St. Mary Catholic Church, St. Mary's School Dedication, 136, 150 listed as deceased. [S11] John J. Weidner, Compiled Birth, Death, 567, 682. [S11] John J. Weidner, Compiled Birth, Death, 567, church records state she was born in 1914; no location. [S102] Arlington Heights Herald, 19 Jan 1945, sect. 1, p. 2, col. 1, Birth date, city, state. [S1066] Clara Weidner, State of Illinois; Department of Public Health - Division of Vital Statistics; Certificate of Death, Birth date, city, state. [S7] St. Mary Catholic Church, St. Mary's School Dedication, 136, 150, Clara is listed as deceased. [S11] John J. Weidner, Compiled Birth, Death, 567, 682, marriage date. [S102] Arlington Heights Herald, 19 Jan 1945, sect. 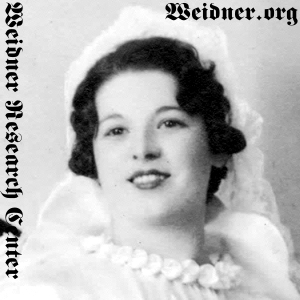 1, p. 2, col. 1, Obituary states she married Oscar Weidner on 23 October 1937. [S1066] Clara Weidner, State of Illinois; Department of Public Health - Division of Vital Statistics; Certificate of Death, No marriage date or location. [S11] John J. Weidner, Compiled Birth, Death, 567, 682, death date only. [S102] Arlington Heights Herald, 19 Jan 1945, sect. 1, p. 2, col. 1, Death date, hospital name. [S1066] Clara Weidner, State of Illinois; Department of Public Health - Division of Vital Statistics; Certificate of Death, Death date, hospital name, village name, county, state. [S11] John J. Weidner, Compiled Birth, Death, 567, burial date only. [S102] Arlington Heights Herald, 19 Jan 1945, sect. 1, p. 2, col. 1, Burial date, cemetery name. [S1066] Clara Weidner, State of Illinois; Department of Public Health - Division of Vital Statistics; Certificate of Death, Burial date, cemetery name, township, county, state.